Muslims, Jews and Christians usually worship on different days in different places. But the celebration of a U.S. Army Chaplain Corps pioneer brought members of the three faith groups together at the Main Post Chapel Friday. 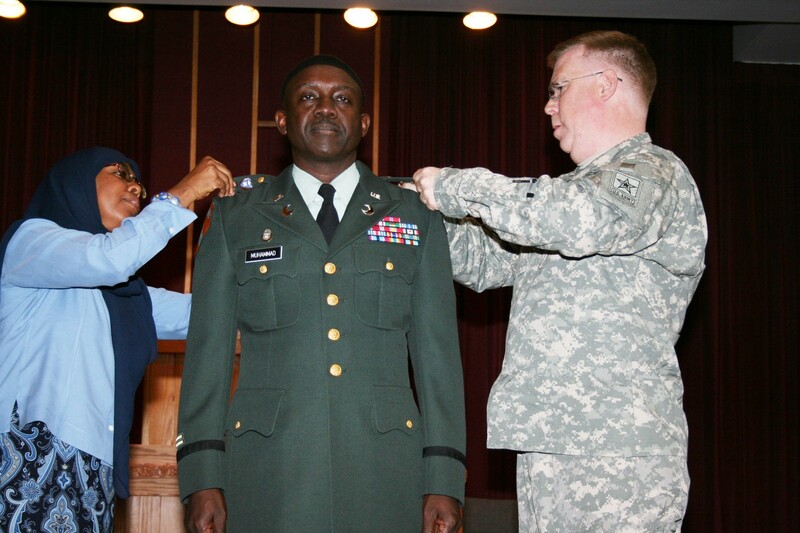 Chaplain Abdul-Rasheed Muhammad, U.S. Army Chaplain Center and School, was promoted to lieutenant colonel in a ceremony that Chaplain (Col.) Samuel Boone, USACHCS commandant, called historic. Muhammad has been an imam since 1978 and became the first Muslim chaplain in the armed forces in 1994. "After the Gulf War, there had been a number of people who had converted to Islam," Muhammad said. "There was an obvious need for subject matter experts and religious accommodations for the Islamic faith." Before DoD could accept Muslim chaplains into the armed forces, an endorsing agency had to be agreed upon. All military chaplains are representatives of a faith group that endorses the chaplain's ministry and is accepted by the military. When the Islamic Society of North America was established as the first Islamic endorsing body, Muhammad submitted his paperwork and ultimately was accepted. Muhammad said being the first Muslim chaplain was not a big concern to him. "I never thought of it as being a really big deal," he said. "I've always wanted to be a chaplain. So, when I had a chance to be a chaplain, it didn't matter to me whether I was the sixth or the tenth. Becoming a chaplain was what was important. ... I'm just thankful to serve and to be a chaplain in the Army Chaplain Corps." Before becoming an Army chaplain, Muhammad served as a chaplain for the Department of Corrections in New York State. He also served as an enlisted Soldier in the Army from 1982-1985. Muhammad said that his prior experience, both as a Soldier and as a civilian chaplain, helped pave the way for him to become an Army chaplain. Air Force Chief Master Sgt. Talib Shareef, stationed at Robins Air Force Base, Ga., has been a friend of Muhammad's since the 1980s. Both were active in the Islamic military community in the Washington area while stationed there. Shareef, who is also an imam, said he was not surprised when Muhammad was selected to be the first Muslim chaplain. "He was the perfect fit to be the first," Shareef said. "He had the background. He had the training. ... He had the (academic) degrees - that opened the way up for him. And he was a person that would accept diversity." Muhammad said he is grateful for the opportunity to represent Islam in the military, especially after 9/11. "Since 9/11, all of our lives have been changed," he said. "I think there's been a certain degree of attention -- and pressure -- placed on Muslim Americans. But I think it's also enabled us a certain degree of opportunity to represent our religion the way that it should be represented. "As a Soldier, and also as a chaplain, it's given me the opportunity to represent my faith on a daily personal basis as well as professionally. I try to take every opportunity to ensure that here at our corps we have the most accurate and correct information that represents Islam. "We (members of the chaplain corps) are the ones who represent religious support -- morale, morals, ethics. I think we have to have good representation from all the faith groups - not just Muslims, but from Christians and Jews and others."